QuaDrorTM 03 certainly does not go unnoticed. 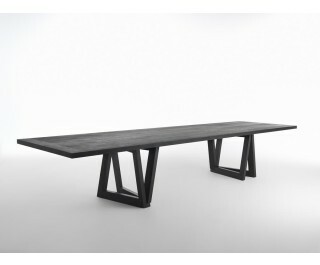 With its 420 cm in length and 120 in width, it is a large and functional table, featuring an impressive design. The balancing act made possible thanks to the QuaDror [TM] structural support system gives this table a sophisticated look, suitable for becoming the star of the home. Top in spruce panelling with ash veneer finished in oil-based stain. Lengthwise internal reinforcements in metal. QuaDrorTM legs in solid ash with oil-based stain.